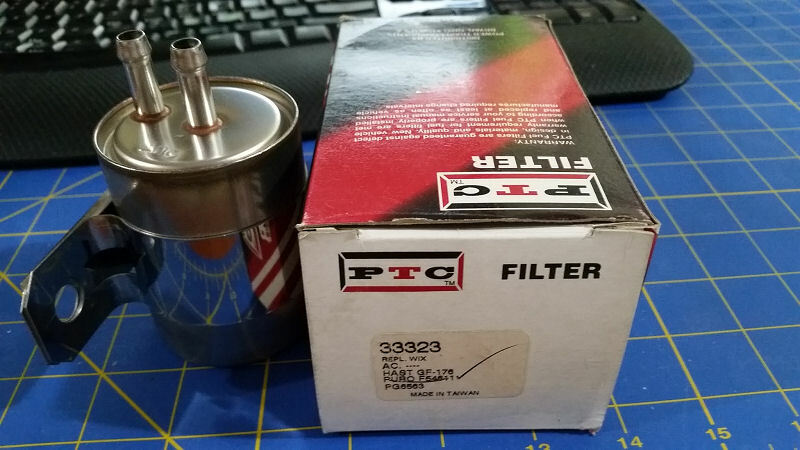 Needing a new fuel filter for an older car i went online to Rock Auto Parts and purchased a Genuine OEM Purolator made in the U.S.A.
After ordering Genuine OEM Purolator fuel filter from Rock Auto Parts they shipped this generic Taiwan filter that leaks fuel. When the postman delivered the part, it was discovered the filter was a cheap generic pos made in Taiwan, not the Genuine OEM Purolator that was ordered. After contacting support via email i was referred to their web help files, and then to the return web form. The part I received looks like it was made by a different brand or company! Sometimes manufacturers buy parts from other manufacturers and re-sell them as their own. In doing so, they declare the quality of the part worthy of their name and stand behind the product with their warranty. Finding a Brand Y part in a Brand X box can be a nice surprise when Y is the vehicle manufacturer (OEM) or another respected brand. It can be frustrating when Y, sold under its own brand, costs less than X. We have no control over manufacturer supply chains. When we buy a part from Brand X, we pay X’s price for it, and your price is based on our cost. If you disagree with a manufacturer’s purchasing decision, you may return the part Shipping is not refundable, and if you re-order the same brand and part number, you’d likely receive an identical part. Rather that pay Rock Auto Parts return shipping cost the generic filter was installed, but leaked gasoline like a sieve! Noticed several posts on Twitter complaining of receiving the wrong part. @RockAuto_Parts i ordered parts & package arrived with packing list of the parts i ordered, but the items in the box are totally different! I’ve sourced a genuine OEM Purolator locally and plan on installing it today. After buying a several parts from this company I’m overall pleased. But this filter deal leaves a “can i trust buying from them again” thought in my mind. Update 03/15/17: Yesterday after this article was published. Rock Auto issued a full refund to my credit card, email below. This is really appreciated! You did order a Purolator part that was not listed as ‘Private Label’ (where we’d expect it to come in a different branded box) – the box should have said Purolator on it. Apologies for this! You also mentioned the part was leaking gas – another issue we can certainly address. Given that you are sourcing a replacement locally, I have set you up to be fully refunded for this order. You do not need to return the part or take any further action. As soon as the refund is issued to your card, we will email confirmation.